Tanis Archer is facing a miserable 25th birthday. She’s a part-time barista in her sixth year at Dallas Community College. Her life is going nowhere, fast. Because on her way to work, she loses control of her car and is killed in a horrific crash. That should have been the tragic end of her story. But days later, she wakes up on a cold morgue slab…and soon learns that miraculous resurrections have brutal side effects. For starters, there are people around her who look as if they are decomposing from the inside-out, victims of their rotting souls. Even worse, it’s no illusion. 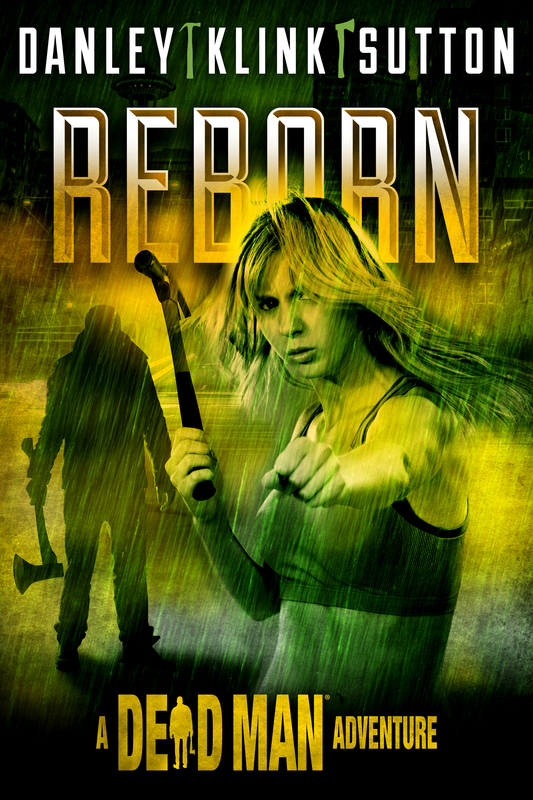 What she is seeing is real, a shadowy part of the world where the bloody battle between good and evil is being fought every day by Matt Cahill, an ax-wielding “dead man” and his rag-tag army of supernatural freaks. And she’s being asked to join him. REBORN features a fresh, colorful heroine in an action-packed, darkly funny tale of adventure and terror told by an incredible dream team of award-winning, widely-acclaimed writers: USA Today bestselling author Kate Danley (The Woodcutter), Emmy Award winning screenwriter and novelist Phoef Sutton (Cheers, Boston Legal), TV writer/producer and author Lisa Klink (Star Trek Voyager, Painkiller Jane), New York Times bestselling author and TV producer Lee Goldberg (The Heist, King City), and two-time Edgar-Award nominated writer William Rabkin (Monk, Psych). About six month ago, I gathered all the authors at my house and we broke the story the way we would in a TV series “writers’ room.” Like Bill and I, Phoef and Lisa are professional television writers…but this was a new way of working for Kate, but I think she liked it. We had a white board up on the wall, plenty of junk food, and only a general sense of where we wanted to go narratively. And then we brainstormed. By the end of the day, we had a story, which we divvied up into thirds for Kate, Phoef and Lisa to write. A couple of months later, when the three parts came in, Bill and I tied them together and smoothed out the rough edges, as we’ve done many times before on scripts on the various TV series we’ve produced. We think REBORN send THE DEAD MAN series in an exciting new direction….and we hope fans of the series will agree!